Vivah - A Journey From Engagement To Marriage ... (Hindi: विवाह, Urdu: وواہ, English: Marriage) is a romantic drama, set in Madhupur and Delhi, released on November 10, 2006. It was produced by India's local movie industry Bollywood and is about the engagement between Prem, an upper-class business manager, and Poonam, a college student, from Madhupur. The film was written and directed by Sooraj R. Barjatya and stars Shahid Kapoor as Prem, Amrita Rao as Poonam and Alok Nath, as well as Anupam Kher as their fathers. Seema Biswas and Amrita Prakash have supporting roles. Vivah was released on November 10, 2006 all over India and received a Telugu dub as Parinayam. Director Sooraj R. Barjatya noted that the story of Vivah is based upon a newpaper article his father read sixteen years ago, in 1988. Like in all of Sooraj R. Barjatya's previous movies, the male lead is, once again, called Prem. Fiming took place during the first months of 2006 - in May 2006, eightyfive percent of the filming was done. The jewellery Poonam receives from Prem during the movie was created by Indian jeweller D’damas, while Amrita Rao's costumes were created by Indian designer Anna Singh and Shahid Kapoor's clothes were created by Shabina Khan. Both designer were part of a crew of 166 people. Filming took place is the small town Madhupur, in Mathura, as well as in Jogeshwari, Almora, Nainital, Dehli, Mumbai, the Filmcity in Goregaon, as well as Madh Island, Lonavla, Ghaziabad, Faridabad, Moradabad and Ranikhet. Shahid Kapoor and Amrita Rao as featured in the film. Poonam (Amrita Rao) lost her parents, when she was very young. She was brought up by her uncle Krishna Kant (Alok Nath) and her aunt Rama (Seema Biswas). However, Rama is jealous of her and barely talks to her, since Poonam is more beautiful than her own daughter Rajni (Amrita Prakash), who is lively and friendly, but lacks Poonam's elegance. Bhagat-ji (Manoj Joshi), a jeweller, and a friend of Krishna Kant, likes Poonam very much and decides to matchmake her with Prem (Shahid Kapoor), Mr. Harish Chandra's (Anupam Kher) son, as Bhagat-ji is friends with Mr. Harichandra. Mr. Harichandra informs Prem of his plans to matchmake him, as he believes Prem is of proper age, young enough to adapt to someone else, and, Prem's brother, Sunil (Samir Soni), was about the same age when he married Bhavna (Lata Sabharwal). Prem, however, is hesitant to marry, since he thinks himself to be too young and wants to focus on his career first. Harichandra convinces him to meet Poonam first. They visit Poonam's family and let Prem and Poonam to get to know each other. Though their first conversation is awkward, Prem and Poonam decide to get married, as they are instantly attracted to each other. The two families agree to meet each other again, so Prem and Poonam get the opportunity to know each other better. Krishna Kant invites Prem's family to their summer residence in Som Sarovar and Harishchandra accepts. Poonam anxiously awaits Prem to come to Som Sarovar, however, until Bhavna arranges a meeting between the two, they barely have the chance to talk to each other. After several carefree days, Harichandra and his family has to leave again because of the family business, which leaves Poonam and Prem only the opportunity to communicate via telephone, internet or letter. Despite the distance between them, they grow closer and Prem, before going to a business trip to Japan, tells Poonam on the phone that he has fallen in love with her. When Prem comes back from Japan, Poonam is there to greet him on the airport, gets to spend some time at his house and finally returns to her own family on order to prepare for the wedding. However, two days before the actual wedding, a fire emerges at Krishna Kant's house. Poonam gets heavily burned, because she saves Rajni. Prem, occupied with his own wedding preparations, is informed by Bhavna of Poonam's accident and goes to see his fiancé at the hospital. She is very unsure if Prem will marry her, now that she has been scarred. The doctor (Mohnish Behl) informs the family that there is hope, however the operation to save Poonam may be dangerous and Poonam will take much time to recover. Harichandra arranges for specialists to be flown in from Dehli and Prem, despite her injury, still wishes to marry her and accepts her as a wife by bringing sindhoor to her at the hospital. The operation is successful and the wedding commences. Like Hum Aapke Hain Kaun, Rajshri Productions released limited number of prints for the film and eventually increased prints with increasing popularity. The film was declared a blockbuster, after earning Rs 22.22 crore net gross after seven weeks of running. As on 06 March2007 the film has earned Rs 30.91crore in box office earning  By the end of November, it was reported that there had been over 4 million(4,000,000*$9.99=Approx.Rs.18Cr.) online streams of Vivah. Running into its sixteenth week, its position still remains in the top five at the Indian box office despite its limited release and competition from some of year's and industry's most successful movies including Dhoom 2, Bhagam Bhag, Baabul, Guru (2007 film), Salaam E Ishq, Eklavya: The Royal Guard all being released after Vivah's debut. Vivah Grand total stands at large 30.91crore + 18crore= 48.91crore for a film made at an honest budget of 10cr. 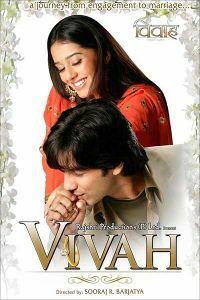 Vivah received a mixed response by critics: Taran Adarsh of IndiaFM generally compliments the actors by calling Shahid Kapoor a "tremendous actor", Amrita Rao "splendid all through" and compliments the strong supporting cast, he criticises the first half as "ordinary/routine". Raja Sen of Rediff gave a generally negative review of Vivah, calling it "a nightmare" and "unforgivably regressive". Deepa Ghalot of Sify.com called Vivah "close to being regressive" and "syrupy sweet", however, she complimented Shahid Kapoor's acting. The Hindustan Times called Vivah "boring" and an "utopia", but complimented Shahid Kapoor and Amrita Rao on their acting, calling the first one "good", but "lacking charisma" and the latter "sweet". "The Hindu" however called Vivah "lovable" and a "choice unlikely to regret". BBC.co.uk complimented Shahid Kapoor as being "playful", called them movie itself however "sickeningly sentimental". The Telegraph criticised Vivah for "lacking plot", "flat characters" and mentioning that the story is "rather weak" and "improbable". Indian painter M. F. Husain, who has painted Madhuri Dixit, the female lead of Sooraj R. Barjatya's Hum Aapke Hain Koun, decided to create a series of pictures inspired by Amrita Rao and Vivah. He announced to create "an entire exhibition around her" and noted her "tremendous potential". He organised a private screen for 150 friends and press attendees to "convey his interest for the film" at Dubai’s Plaza cinema. The Regent, a theater in Patna, Bihar, has put up a huge paandal (festive banner) in order to promote the movie. The paandal reads Poonam weds Prem and the theater has been getting inquiries if they entered the wedding business. Several movies have been highly successful in Bihar and their protagonists have been emulated by the movie goers; in Vivah's case, it has become fashionable to wed like Poonam and Prem from Vivah. To promote the movie, Shahid Kapoor and Amrita Rao have sold tickets themselves at the Fame Malad Theatre in Malad, Mumbai. Also, there have been sarees, bindis and free ticket give-aways in several theatres where the movie ran. Vivah is the first Indian movie to be simultaneously released in cinema and on the production company's official site. Rajshri Media Limited, the digital arm of the Rajshri group is responsible for the release. The company hopes to marginalise piracy. Rajshri.com has served one million streams within seven days in association with limewire networks i.e.one stream is priced at $9.99 roughly it makes Rs.4.5cr. in the first week it self, and Rajjat A. Barjatya, managing director of Rajshri Media Limited claims that Vivah has done "very well" being streamed online. However, it also means that DVD release of the film will get affected as its already been seen by Home viewers. Soundtrack includes a Bonus CD from Ustad Bismillah Khan. Ravindra Jain, the music director of Vivah has put together a soundtrack of old world charm, with a full orchestra behind some of the best known voices of the Hindi movie scene. The orchestra combines with classical Indian instruments, like the sitar and tabla to produce a blend between classical western and classical Indian music. The music has, however been criticised due to its monotony, with the range of singers, choice of instrument and music arrangements being very similar. Rediff.com wrote in its music review that "Vivah's music disappoints". Prem (Shahid Kapoor). A young man from Delhi, just to about to start his career at his father's enterprise. He gets engaged to Poonam and falls in love with her. Poonam (Amrita Rao). A young woman from Madhupur with very traditional values. She is an orphan and lives with her uncle, aunt and cousin Rajni and gets engaged to Prem. Mr. Harichandra (Anupam Kher). Prem's and Sunil's father, a kind man and head of his own enterprise. Bound to traditional values and very loving to his family, he urges Prem to get engaged to Poonam. Krishna "Chacha" Kant (Alok Nath). Rajni's father and Poonam's uncle. He loves his niece very much and only hesitantly agrees to let her leave his house. Rama "Chachi" (Seema Biswas). Rajni's mother and Poonam's aunt. She is barely talking to Poonam and very jealous of her, as Poonam is more beautiful and elegant than her own daughter, and will get such a great opportunity to marry into a rich and kind family. She and her husband argue often. Sunil, Prem's brother (Samir Soni). Prem's brother and Mr. Harichandra's son. He works at his father's enterprise and is always seen reading newspapers. Though sometimes seemingly cross, he very much loves his family. Bhavna, Sunil's wife (Lata Sabharwal). Sunil's wife. She is a warm, kind and humorous person and takes care of her husband's and father-in-law's household. She arranges the meetings between Prem and Poonam. Rajni "Choti" (Amrita Prakash). Krishna Kant's and Rama's daughter, and Poonam's cousin. humorous and a little bit mischievous, she does everything for her sister and Prem to meet and fall in love with each other. Bhagat-ji (Manoj Joshi). A jeweller and trader. He knows both the families of Prem and Poonam and arranges a meeting and the engagement of the children. Munim-ji (Dinesh Lamba). Krishna Kant's secretary and occasional answering machine to Prem's calls for Poonam. Rahul (Ameya Pandya). Bhavna's and Sunil's son. A lively, but mischievous young boy. Doctor Rashid Khan (Mohnish Behl in a guest appearance). The doctor Poonam gets treated by. An able and very concerned man. This is the fourth film of the pair Shahid Kapoor and Amrita Rao. Before this film, they worked in three more: Ishq Vishk (2003), Vaah! Life Ho To Aisi (2005) and Shikhar (2005). ^ a b http://www.ciol.com/. Rajshri Media launches entertainment portal. Retrieved on 30 December 2006. ^ http://www.bbc.co.uk. Vivah on bbc.co.uk. Retrieved on 30 December 2006. ^ http://rajshriproductions.com/. Rajshri News. Retrieved on 30 December 2006. ^ www.indiafm.com. Cast & Crew for Vivah. Retrieved on 30 December 2006. ^ www.rediff.com. I'm waiting for Salman to see Vivah. Retrieved on 30 December 2006. ^ www.rediff.com. First look: Amrita-Shahid's Vivah. Retrieved on 30 December 2006. ^ www.telegraphindia.com. Of rings and relationships. Retrieved on 30 December 2006. ^ www.telegraphindia.com. Vivah is not another Hum Aapke Hain Koun..!. Retrieved on 30 December 2006. ^ a b www.rajshriproductions.com. Vivah: Official Homepage. Retrieved on 30 December 2006. ^ http://www.hindu.com. When Cupid strikes. Retrieved on 30 December 2006. ^ www.indiafm.com. Vivah continues to grow. Retrieved on 30 December 2006. ^ wwww.boxofficeindia.com. Boxoffice India News. Retrieved on 30 December 2006. ^ www.indiafm.com. IndiaFM.com Vivah Movie Review. Retrieved on 30 December 2006. ^ in.rediff.com. Vivah needs Salman and a script. Retrieved on 30 December 2006. ^ sify.com. Sify.com movie review. Retrieved on 30 December 2006. ^ sify.com. Sooraj R Barjatya. Retrieved on 30 December 2006. ^ The Hindi. Game for deja vu?. Retrieved on 30 December 2006. ^ BBC movie review. Vivah - A Journey from Engagement to Marriage. Retrieved on 30 December 2006. ^ Telegraph India Review. Made By Rajshri. Retrieved on 30 December 2006. ^ a b Hindustan Times. Now, Amrita has entered by canvas: M. F. Husain. Retrieved on 30 December 2006. ^ Sify.com. M. F. Husain immortalizes Amrita Rao & Vivah. Retrieved on 30 December 2006. ^ MumbaiMirror.com. The Marriage Circle. Retrieved on 30 December 2006. ^ Shahid, Amrita enthrall patrons at Fame Malad. Shahid, Amrita enthrall patrons at Fame Malad. Retrieved on 6 January 2007. ^ Vivah marketing: Sarees, train tickets, bindi packets. Vivah marketing: Sarees, train tickets, bindi packets. Retrieved on 6 January 2007. ^ a b Rediff on Vivah's internet release. Now, watch new Hindi films online!. Retrieved on 30 December 2006. ^ a b Rediff on Vivah's music. Vivah's music disappoints. Retrieved on 30 December 2006. This page was last modified 07:37, 25 March 2007.